White tea can be any cultivar (varietal) from Camillia sinensis. The process after plucking defines white tea—which is that almost nothing is done to the tea leaf after it is picked. After plucking, the leaves (or just the unfurled buds) are brought back to the processing facility and laid out to whither and naturally air dry. 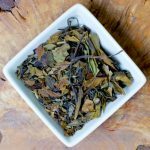 In some cases, because this tea is not de-enzymed like green tea, it may have some slight oxidation due to incidental bruising in transport. The flavor ranges from very light and mild to slightly toasty—depending on the cultivar and whether any bruising occurred. 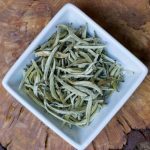 This is a rare, beautiful white tea that is similar to Chinese Silver Needle in that it is just the unfurled bud, but has a whole different character–sweeter, richer and more floral. Its origins are Kenya and if you like white tea, you will appreciate its unique and flavorful qualities. 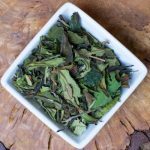 Many customers have cold-steeped this tea and had excellent results! Just the leaves are left after the bud is used for silver needle and that is what makes shou mei. 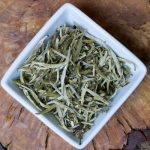 This white tea has deep, rich flavor and makes a satisfying morning tea. Try steeping it with some cinnamon chips for an afternoon treat. I’m so happy to offer this rare and wonderful Silver Needle from Sri Lanka! When I was there in 2014 our group toured one of the tea gardens growing the unique cultivar for this tea. This cultivar of Camellia sinensis does not produce the quantity of new growth found in the traditional assamica and the yield is lower–but well worth it. The taste of white Ceylon is slightly earthy with light notes of stone fruit. Also known as Bai Mu Dan. A delicate tea made from tea buds collected and withered prior to opening. It offers a preponderance of unopened leaf buds that create a pale yellow, light bodied, yet complex cup with hints of honeydew and a faint floral sweetness.